Only showing entries about fake from A Longwinded Journey South. View entries about fake from all Travellerspoint blogs. During exchanges with vendors here, bills are nearly always checked for authenticity, although we hadn’t felt the need to take the same precautions about the cash we were handed until recently. Aside from monopoly money, I had never had fake cash in my possession until one afternoon in Puerto Lopez. Puerto Lopez is a coastal town with access to national parks, the “Poor Man’s Galapago’s” and a steady stream of tourists. We were about to find that where there are tourists, counterfeit bills are not uncommon. In our case, we had jumped at a long-awaited opportunity to snorkel off the coast of Ecuador, the day after arriving in Puerto Lopez. We had bargained for a decent price for a half-day boat trip to try to snorkel (often each person in a group pays a different price, and vendors or guides keep close track of what they told each person)… So we met with about 10 other people near the beach and gave the second half of our payment to the collection woman. We needed change (which tends to elicit complaints) so she opened a super-compartmentalized wallet which contained a great deal of large bills. She fished around a bit and handed us a $5 bill (Ecuador’s currency is USD) and $3 in change (they use $1 Sacajawea’s instead of bills [apparently all of that pre-credit card subway change was being funneled into Ecuador]). So we gladly accepted our change without paying careful attention to the bills. After an enjoyable boat ride, but no snorkeling because of murky water after storms, we made it back on land. I asked the woman who took our money how they charge people for snorkeling trips when they know there will be no snorkeling… she came up with a number of excuses and more or less walked away. Later that day, we went to pay for groceries and T.L. 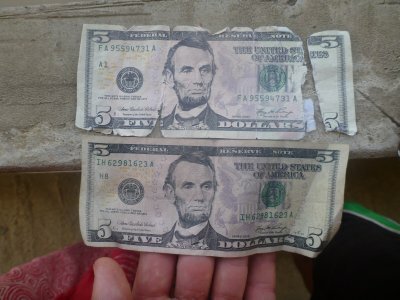 found that his five-dollar-bill had mostly disintegrated, after getting wet on the boat. He paid with some coins and when we stepped onto the street, he showed me the bill… a laughably fake disintegrating piece of paper. 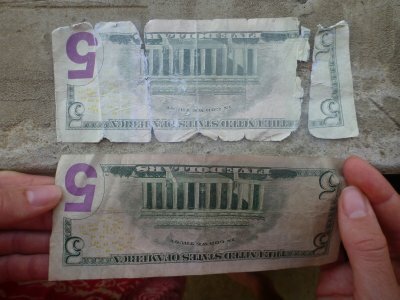 Counterfeit money! My instinct was to go back to the snorkeling place and explain what had happened, but we discussed our options before making moves: go to a bank, go to the police, go to the woman who gave it to us, try to put it back together and use it, call it bad luck and forget about it. My feeling of having been wronged said no to the last two options, so we asked our hostel owner how often this happened and what he suggested we do. He said in the past, a great deal of counterfeit $20’s would come in from Colombia, but more recently, counterfeiting $5’s had come into practice because they went more unnoticed. He suggested the only way anything might be done about it would be to go directly to the woman who had given it to us, because the police were corrupt and the banks wouldn’t do much either. We walked back to the tour office and I announced to a group of 6 or so people that we had been given a counterfeit $5 that morning. No one moved from their hammocks or their chairs, but everyone asked me to come show them the bill. Each shook his head, affirming that “no vale nada”. They began to explain, however, that the woman I had paid wasn’t there. After a few minutes of describing the woman and some debating about how fat she was (one of the first things people ask when you try to describe a person is if they are fat, no offense to any of the fat people in the room). They finally determined that it was Julia, la gorda (the fatty), whose mother had cheated one of the man’s mothers out of $50 ten months ago. Of course, that must be her! After a series of phone calls, they summonsed Julia la Gorda to the tour office. We sat and waited as other people filtered in and out while the others related our story and passed around the five to the newcomers. Finally, after a bit of waiting, Julia la Gorda appeared and was directed to T.L. and I with our disintegrated cash. We explained our story and she quickly denied that she gave it to us, but under the scrutinizing eyes of her peers, she changed the five without too much prodding. She proceeded to show us the rest of her real $5’s and how to tell that bills were counterfeit, while T.L. continued to try to give the new $5 backs to her, because he didn’t understand that she was actually giving us one. When we finally had the $5 back, we thanked her and left, perplexed at the exchange. Earlier we were sure that the snorkeling-free trip cost us an extra $5 that day, but we walked out with our $5 restored. We have no way of knowing whether Julia la Gorda knew the bill she handed us was fake, whether she was part of a larger counterfeiting ring, or whether she was totally innocent. In the end, a wet boat ride made it so the bill was taken out of circulation and we have learned to be more conscious of the bills we receive in our travels.